These Glock 31 factory magazines are a great way to extend your shooting time at the range or carry extra ammunition. Having to stop shooting after a couple mags to refill isn't very fun! Each magazine holds fifteen rounds of .357 SIG ammunition. This is the standard length for the G31 and will fit flush with the grip. 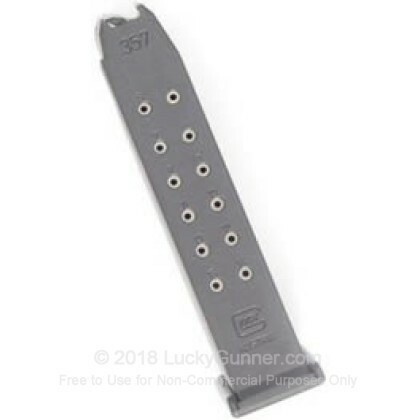 They can also be used with Glock's other .357 SIG pistols such as the G32 and G33, though the magazine will protrude significantly from the grip. Glock mags are made of a sturdy gray polymer with a heat treated metal insert that keeps the rounds inside in place. Perforations in the back of the mag serve as a visual aid for loading.